Robert’s practice focuses on complex civil litigation for a range of business clients, including large companies, small businesses, manufacturers, real estate owners and developers, and trustees. Robert has tried jury and non-jury cases in state and federal courts in North and South Carolina. He has handled appeals before the Court of Appeals and Supreme Courts of North and South Carolina, as well as the Fourth Circuit Court of Appeals. Weathering the Storm of Data Breach Liability, Commercial Law WebAdvisor Webinar, June 27, 2017 – A presentation and discussion on cyber security, the rising cost of data breaches, the insurance products available to address these exposures, and the examination of the benefits of cyber liability insurance, including its underwriting process and services offered to policyholders. Recent Developments in Electronic Discovery & Defense Strategies, Hannover, Germany, June 13, 2017 – A seminar and discussion for German jurists and entrepreneurs on recent developments in electronic discovery risks, challenges and defense strategies. The War Against Fiduciaries: A Growing Trend in Trust & Estate Litigation, Commercial Law WebAdvisor Webinar, April 25, 2017 – A presentation and discussion exploring the different parties who are charged with a fiduciary duty, the duties and obligations of these fiduciaries, and the tools fiduciaries need to prepare for and fight on this growing battlefield. Data Breach and Cyber-liability: Preparing for Litigation, Charlotte, NC, February 27, 2014 – The first presentation as a part of the Privacy & Data Security team’s seminar series, focusing on the costs of data breaches, the requirements of data breach statutes and how best to defend a data breach lawsuit in the unfortunate event that litigation arises. Data Breach and Cyber Liability in South Carolina, Charleston, SC, October 16, 2013 – A CLE presentation on how to defend a data breach lawsuit and how to help clients before and after a data breach. Cyber Liability: Data Breach Litigation in the Wake of the South Carolina Department of Revenue Hacking Scandal, South Carolina Defense Trial Attorneys’ Association 46th Annual Summer Meeting, Asheville, NC, July 26, 2013 – A presentation as part on data breach liability in South Carolina. Lead counsel representing a family in a series of actions pending in Probate and Circuit Courts in Beaufort, SC, seeking to remove a trustee from revocable, irrevocable, and charitable trusts and recover damages for breach of trust and breach of fiduciary duty. After five years of litigation, the cases settled. December 2018. Lead trial counsel in a jury trial in Circuit Court in Charleston County, SC defending a property owner from personal injury claims related to an alleged toxic exposure. The case settled after two days of trial. September 2018. Represented an online travel company in a class action filed in District Court in SC. The District Court granted the travel company’s motion to dismiss on the grounds that the arbitration clause and class action waiver contained in the hybrid click-wrap/browse-wrap agreement were enforceable. June 2018. Lead counsel for the plaintiff trust in an LLC derivative proceeding pending in the South Carolina Business Court, seeking damages for breach of contract, breach of fiduciary duty, and an accounting. The case settled after two years of litigation. May 2018. Lead trial counsel in a two-week jury trial in Circuit Court in Charleston County, SC defending a property owner from claims of breach of contract and interference with contract after the property was damaged by fire. The owner settled with two of the parties after the trial. The remaining portions of the case are currently on appeal in the South Carolina Court of Appeals. February 2018. Lead counsel representing a German machine manufacturer in a series of products liability cases filed in District Courts and state courts in South Carolina, Pennsylvania, and Alabama. All of the cases settled prior to trial. May 2015-September 2018. Lead counsel for the trustee of an irrevocable trust in a matter pending in Probate Court in Beaufort County, SC, defending against claims of breach of trust and breach of fiduciary duty. After two years of litigation, the case settled at mediation. May 2017. Lead counsel for a community bank in an action pending in Circuit Court in Horry County, SC, defending against claims for breach of contract, unfair trade practices, fraudulent misrepresentation, negligent misrepresentation, and conversion. After three years of litigation, the case settled at mediation. August 2015. Lead counsel for a real estate developer in an action pending in Circuit Court in York County, SC, defending against negligence causes of action related to a catastrophic motor vehicle accident and resulting brain injury. After three years of litigation, the case settled at mediation. June 2014. Lead trial counsel in a bench trial in Circuit Court in Charleston County, SC representing a financial institution and lead loan participant seeking to recover damages in excess of $20 Million arising from a default of a commercial loan. The case settled after two days of trial. October 2013. 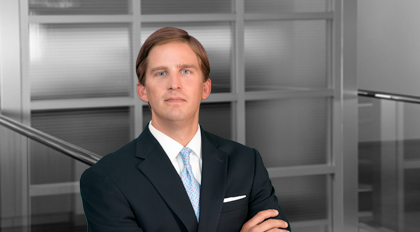 Lead trial counsel in a jury trial in Circuit Court in Jasper County, SC, defending a banking institution from claims of breach of contract, promissory estoppel, conversion, and negligent misrepresentation arising out of an alleged lease agreement. The case settled after three days of trial. March 2013. Lead trial counsel for plaintiff logging company in a binding arbitration in Richland County, SC, seeking damages for breach of a logging contract. At the conclusion of arbitration, the plaintiff recovered the full measure of damages owed under the contract. December 2012. Lead trial counsel in a bench trial in Circuit Court in Beaufort County, SC, defending a licensee for claims relating to a breach of a license agreement. After a favorable ruling at trial, the ruling was later affirmed by the South Carolina Supreme Court. February 2011. Lead trial counsel in a week-long bench trial in District Court in SC, defending a vessel owner from claims and personal injury damages arising under the Jones Act. Following a favorable ruling from a trial court, the parties reached a settlement. March 2010. Lead trial counsel in a multi-day bench trial in Circuit Court in Berkeley County, SC, defending a large banking institution who was sued for failure to stop payment on certified checks under Articles 3 and 4 of the Uniform Commercial Code. After a favorable ruling from the trial court, the ruling was affirmed by the South Carolina Court of Appeals. June 2009.